The Ant Lab is much more than a room in a building: it is a group of like-minded enthusiasts. We are all studying social insects in general, and ants in particular, not just for their own sake but because these are model organisms for understanding principles that are both fundamental and general in biology. Our focal organisms facilitate studies within almost every field in biology. These include molecular genetics, allometry and development, chemical ecology, communication systems, division of labour, co-operation and conflict, kin selection and inclusive fitness, mating systems and sexual selection, algorithmic intelligence, cognition, decision-making systems, individual and collective intelligence, self-organization and complexity, population dynamics, ecology and conservation. This interest in a plethora or topics is not an idle boast. Over the years, the ant lab has published pioneering papers (and associated books) that enter each of these fields. In some ways, 'The Ant Lab' is a misnomer. We do mostly study ants, but the group has often welcomed post-docs with expertise with other social insects especially honey bees and bumble bees. In addition, Prof. Franks has wide interests in evolutionary and mathematical biology. Thus, he has published studies on chimpanzees, cuckoos, C.elegans and even the mathematics of leaf shape. We hope that by exploring this web site some of our enthusiasm for ants as model organisms will rub-off on you and kindle that spark of wonder and boundless curiosity that is the foundation for all scientific research. 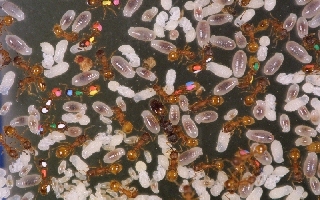 Image showing a marked Temnothorax albipennis colony. Colonies may be marked in this way so that individuals can be tracked in order to determine what behaviours they demonstrate.